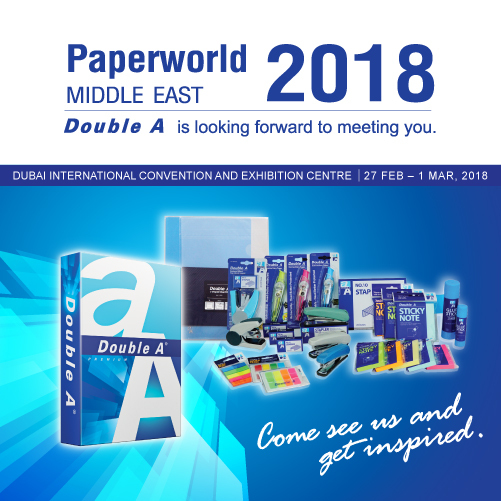 Dubai, UAE: Double A will show its green credentials and entire range of sustainable paper and stationery products at Paperworld Middle East exhibition, which take place at booth 2-A12 in Hall 2 of Dubai International Convention and Exhibition Centre from Feb 27th to March 1st 2018. “Paperworld ME has extended our reach to Direct customer who would like to help develop Double A product distribution in countries in Middle East & Africa. Thus this unique platform helps thrive our objective of greater partnership with keen companies committed to work with 100% self sustainable company like Double A.” said Mr.Thirawit Leetavorn, Double A Senior Executive Vice President. Double A customer, business partners and paper consumer from all over Middle East and Africa will get the chance to speak with Double A representative from the region and discuss about the latest trends in the paper industry, new brand offerings, promotions, current and future projects and possible business opportunities with Double A.